Jeffrey Lynn Goldblum (/ˈɡoʊldbluːm/; born October 22, 1952) is an American actor and musician. He has starred in some of the highest-grossing films of his era, Jurassic Park (1993) and Independence Day (1996), as well as their respective sequels, The Lost World: Jurassic Park (1997) and Jurassic World: Fallen Kingdom (2018), and Independence Day: Resurgence (2016). Goldblum was born and raised in West Homestead, Pennsylvania, a suburb of Pittsburgh. His mother, Shirley Jane Goldblum (née Temeles; 30 October 1926 – 9 January 2012), was a radio broadcaster who later ran a kitchen equipment and appliances sales firm, and his father, Harold Leonard Goldblum (25 April 1920 – 23 February 1983), was a medical doctor and Major in the US Army during World War II. He has a sister, Pamela, and an older brother, Lee. Another older brother, Rick, died of kidney failure at age 23. His family is Jewish, and had emigrated from Russia and Austria to the U.S. During his childhood, Goldblum belonged to an Orthodox synagogue and had a bar mitzvah. Goldblum's parents were interested in show business. His father nearly studied acting before deciding to pursue medical studies. Goldblum moved to New York City at 17 to become an actor. He worked on the stage and studied acting at the renowned Neighborhood Playhouse under the guidance of acting coach Sanford Meisner. He made his Broadway debut in the Tony Award-winning musical Two Gentlemen of Verona. He is also an accomplished jazz pianist and declared that if he did not act, he would have become a professional musician. Goldblum made his film debut as a home-invading thug in the 1974 Charles Bronson film Death Wish. He briefly appeared as a protester in the TV movie Columbo: A Case of Immunity (1975). He has a brief part as a party guest in Annie Hall (1977); Goldblum is seen saying into the telephone at a Hollywood party, "This is Mr. Davis. I forgot my mantra." 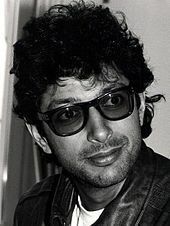 Goldblum has had leading roles in films such as The Fly (1986), Jurassic Park (1993), Earth Girls Are Easy, The Tall Guy, Vibes (1988) and Into the Night (1985). Goldblum's strong supporting roles include those in Invasion of the Body Snatchers (1978), The Big Chill (1983), and Independence Day (1996), as well as the Wes Anderson films The Life Aquatic with Steve Zissou (2004) and The Grand Budapest Hotel (2014) and the cult films The Adventures of Buckaroo Banzai Across the Eighth Dimension (1984) and Igby Goes Down (2002). For several years, Goldblum was the voice for most U.S. Apple commercials, including advertisements for the iMac and iBook. He also voices some U.S. Toyota commercials as well as Procter & Gamble's facial cream line. He has recently appeared on Irish TV in commercials for the National Lottery. Goldblum taught acting at Playhouse West in North Hollywood with Robert Carnegie. It was with several actors from this acting company that he improvised and directed the live action short film Little Surprises, which was nominated for an Academy Award in 1996. Goldblum got the role of Adam in Adam Resurrected, a film adaptation of the Yoram Kaniuk novel about a former German entertainer who becomes the ringleader to a group of Holocaust survivors in an asylum after World War II. Jeff Goldblum at the 2007 Toronto International Film Festival. In September 2006, it was announced that Goldblum was one of the founding members of a new theater company in New York called The Fire Dept. He made a guest appearance on Sesame Street in 1990 as Bob's long-lost brother Minneapolis (parody of Indiana Jones), in a sketch where Big Bird's friend Snuffleupagus had "the golden cabbage of Snuffertiti" hidden in his cave. He has also appeared on Tom Goes to the Mayor, The Colbert Report, Tim and Eric Awesome Show Great Job!, and Portlandia. In 2014, Goldblum's jazz band, The Mildred Snitzer Orchestra, did a weekly show at the Carlyle Hotel. Goldblum replaced Chris Noth as a senior detective on Law & Order: Criminal Intent. In the series, Goldblum plays Detective Zack Nichols. 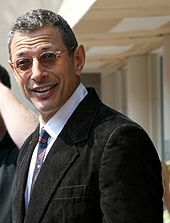 In August 2010, media outlets reported that Goldblum had decided not to return to Criminal Intent due to persistent concerns about the program's future. In 2014, Goldblum appeared in an episode of Last Week Tonight parodying his role in Law & Order. In 2016, he reprised his role of David Levinson in Independence Day: Resurgence, the sequel to Roland Emmerich's 1996 alien invasion/disaster film Independence Day. In November 2015, he joined the ensemble cast of Shane Carruth's third film, The Modern Ocean alongside Anne Hathaway, Keanu Reeves, Daniel Radcliffe, Chloë Grace Moretz, Tom Holland, Asa Butterfield, and Abraham Attah. Goldblum played The Grandmaster in the Marvel superhero film Thor: Ragnarok (2017), reuniting with fellow Jurassic Park cast member Sam Neill. He also reprised his role as Dr. Ian Malcolm in the franchise's fifth film, Jurassic World: Fallen Kingdom (2018). He was featured in a Currys Christmas advert campaign in November 2015. Goldblum does the commercials for Apartments.com. In 2017, Goldblum also did a series of online commercials for the Australian food ordering app Menulog. On 29 May 2018, Billboard announced that Goldblum had signed to Decca Records to release a studio album later that year. The Capitol Studios Sessions was released on 9 November 2018. In July 2018, a 25 ft (7.6m) statue of Goldblum, a temporary installation, appeared next to London's Tower Bridge to mark 25 years of Jurassic Park. From 1980 to 1986, Goldblum was married to Patricia Gaul, with whom he appeared in Silverado (1985). From 1987 to 1990, he was married to Geena Davis, his co-star in three films: Transylvania 6-5000 (1985), The Fly (1986), and Earth Girls Are Easy (1988). In mid-2014, he became engaged to Canadian Olympic gymnast Emilie Livingston; the couple married on November 8, 2014. On January 9, 2015, Goldblum announced on the Late Show with David Letterman that the couple was expecting a son. Their son Charlie Ocean was born on July 4, 2015. Goldblum announced on the January 11, 2017, episode of Conan that Emilie was pregnant with their second child. Their second child, a boy named River Joe, was born April 7, 2017. Goldblum in 2017 at the Deauville American Film Festival. 1975 Columbo Protector Episode: "A Case of Immunity"
1976 The Blue Knight Daggett Episode: "Upward Mobility"
1977 Starsky & Hutch Harry Markham Episode: "Murder on Stage 17"
1982 Laverne & Shirley Jeffrey Episode: "Watch the Fur Fly"
1984 American Playhouse Unknown Episode: "Popular Neurotics"
1985 Faerie Tale Theatre Buck Wolf Episode: "The Three Little Pigs"
1986 The Ray Bradbury Theater Cogswell Episode: "The Town Where No One Got Off"
1990 Sesame Street Minneapolis Episode: "21.72"
1995 The Larry Sanders Show Jeff Goldblum Episode: "Nothing Personal"
1996 The Simpsons MacArthur Parker (voice) Episode: "A Fish Called Selma"
1998 Mr. Show with Bob and David Civil War Narrator (voice) Episode: "Like Chickens... Delicious Chickens"
2002 King of the Hill Dr. Vayzosa (voice) Episode: "The Substitute Spanish Prisoner"
2003 Friends Leonard Hayes Episode: "The One with the Mugging"
2004 Tom Goes to the Mayor Bill Joel (voice) Episode: "Toodle Day"
2011 NTSF:SD:SUV:: Gunnar Geirhart Episode: "Full Hauser"
2011 Allen Gregory Perry Van Moon (voice) Episode: "Van Moon Rising"
2015 Inside Amy Schumer Jury Foreman Episode: "12 Angry Men Inside Amy Schumer"
2016 Unbreakable Kimmy Schmidt Dr. Dave Episode: "Kimmy Meets a Celebrity!" ^ "Shirley Tyson obituary". www.legacy.com. ^ "Harold Goldblum grave". www.findagrave.com. ^ Curtis, Nick (January 29, 2008). "What Jeff loves about London". This is London. Archived from the original on February 1, 2008. Retrieved January 29, 2008. ^ "Jeff Goldblum: Not Dead Yet". www.genealogywise.com. ^ Barlow, Eve (June 12, 2016). "Jeff Goldblum: 'I'm like one of those yogis who wanders the Earth with a diaper'". The Guardian. ^ Curtis, Nick (January 29, 2008). "What Jeff loves about London". London Evening Standard. Retrieved October 28, 2012. ^ "Jeff Goldblum goes to the head of the class | Fall Preview". Jewish Journal. September 10, 2012. Retrieved October 28, 2012. ^ Stephen, By (April 26, 2007). "Holocaust role a spiritual journey". News.com.au. Retrieved October 28, 2012. ^ Knutzen, Eirik (March 30, 2007). "TV Close-Up: Jeff Goldblum". Bend Weekly. Retrieved January 29, 2008. ^ "Five surprising facts about Jeff Goldblum". BBC. Retrieved April 2, 2019. ^ "10 Greatest Actor Cameos in Woody Allen Movies – Film School Rejects". Film School Rejects. September 15, 2011. Retrieved April 30, 2017. ^ "Jeff Goldblum Has 'Criminal Intent,'Chris Noth leaving 'Law & Order' series". Zap2it. Archived from the original on June 27, 2008. Retrieved June 27, 2008. ^ Schneider, Michael (August 3, 2010). "Jeff Goldblum exits 'Law & Order'". Variety. Retrieved August 4, 2010. ^ "Jeff Goldblum to quit Criminal Intent". The Spy Report. August 4, 2010. Archived from the original on August 30, 2010. Retrieved August 4, 2010. ^ Kit, Borys (November 3, 2015). "Anne Hathaway, Keanu Reeves, Daniel Radcliffe to Star in 'The Modern Ocean'". The Hollywood Reporter. Retrieved November 5, 2015. ^ Breznican, Anthony (May 20, 2016). "Thor: Ragnarok: Cate Blanchett, Jeff Goldblum, and more join cast". Entertainment Weekly. Retrieved May 21, 2016. ^ Ford, Rebecca (April 26, 2017). "Jeff Goldblum Joins 'Jurassic World' Sequel (Exclusive)". Hollywood Reporter. Retrieved April 26, 2017. ^ Liviu Marica. "Currys PC World: Jeff Goldblum campaign". Daily Commercials. Retrieved November 22, 2015. ^ "Jeff Goldblum as Brad Bellflower". Apartments.com. Retrieved April 26, 2016. ^ Smirke, Richard (May 29, 2018). "Jeff Goldblum Signs With Universal's Decca Records". Billboard. Retrieved May 30, 2018. ^ "Hear the first songs from Jeff Goldblum's jazz album". EW.com. Retrieved September 6, 2018. ^ "Jeff Goldblum statue marks 25 years of Jurassic Park". BBC News. BBC. July 18, 2018. Retrieved July 18, 2018. ^ Yahr, Emily (November 11, 2014). "Jeff Goldblum married a contortionist half his age". The Washington Post. ^ Dave Itzkoff (September 12, 2014). "Playing Piano, and Blaming Woody Allen: Jeff Goldblum's Orchestra debuts at the Carlyle". The New York Times. Retrieved September 12, 2014. ^ "Interview". Late Night with David Letterman. Green Bay, Wisconsin. January 9, 2015. CBS. WFRV-TV. Retrieved January 9, 2015. ^ Chestang, Raphael (July 7, 2015). "Jeff Goldblum Welcomes Baby Boy: See the First Family Photo!". Entertainment Tonight. Retrieved July 8, 2015. ^ Marquina, Sierra (July 17, 2015). "Jeff Goldblum's Wife Emilie Livingston Shows Off Insanely Flat Stomach Eight Days After Giving Birth". Us. ^ "Jeff Goldblum/Coyote Peterson/Jimmy Eat World", Conan (January 11, 2017), Season 7, Episode 28. TBS. ^ Miller, Jenni (April 15, 2017). "Jeff Goldblum and Emilie Livingston Welcome Their Second Baby". New York Magazine. Retrieved April 29, 2017. ^ "Jeff Goldblum: The Ultimate Filmography of Our Greatest Living Actor". Portland Mercury. June 22, 2016. Retrieved April 2, 2019. ^ "The Capitol Studios Sessions by Jeff Goldblum & The Mildred Snitzer Orchestra". November 9, 2018. Retrieved September 25, 2018. Wikimedia Commons has media related to Jeff Goldblum. Jeff Goldblum: the Buddha of Hollywood from The Guardian, July 12, 2010.